Once you register you will be contacted for follow up information. 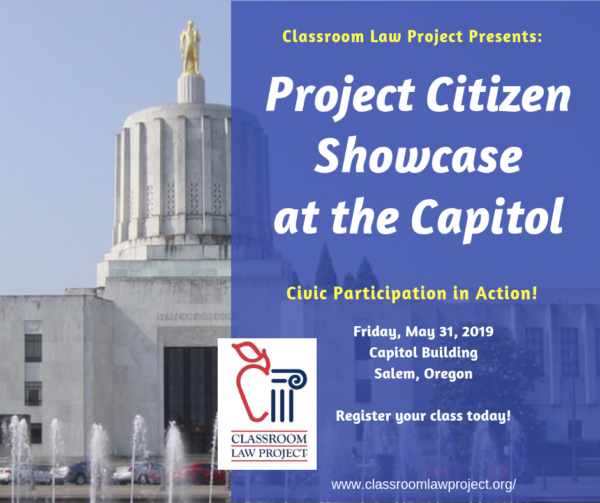 On May 31, 2019, Classroom Law Project will host a Showcase at the State Capitol in Salem to present Project Citizen simulated congressional hearings to a panel of legislators and civic leaders. Students have an opportunity to display their class portfolios, see other projects from schools around the state, and receive feedback from community members. Classroom Law Project will reimburse any teachers for the cost of their substitute, and offers a stipend of up to half of the cost of transportation for classes traveling more than 100 miles round trip.